On Thursday June 14, 2018, The Center for Communication in Medicine’s (CCM) Executive Director, Dr. Bernard Bandman, was the keynote speaker at the spring meeting of the American College of Surgeons -Vermont Chapter in Quechee, VT.
Dr. Bandman’s presentation, Difficult Conversations with Patients and Families Facing Serious Illness, prompted rich discussion about the challenges surgeons face when delivering bad news. As Dr. Bandman notes, “Doctors have a hard job. Diagnostic information about results of surgery or biopsy can be hard for patients and families to hear as well as doctors to say. And, when discussing a plan of care, patients and loved ones may have difficulty recalling what the doctor said because bad news can be emotionally overwhelming.” Dr. Bandman offered strategies for effective communication about hard-to-talk about subjects. Included in the presentation was an introduction to the Difficult Conversations Toolkit® which is the cornerstone of CCM’s SpeakSooner programs to help prepare patients to actively engage in openly discussing risks and benefits of treatment options and quality of life considerations sooner in the course of illness. Dr. Bandman cited studies that showed improved doctor-patient communication results in greater patient satisfaction and reduced health care costs. 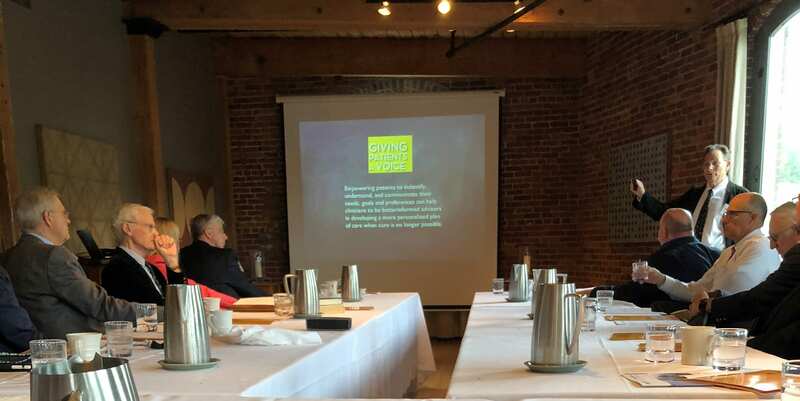 Southwestern Vermont Health Care’s Dr. Simon P. Drew, President of American College of Surgeons-Vermont chapter, invited Dr. Bandman to be the keynote speaker where over 30 surgeons attended. Dr. Bernard M. Bandman speaking at the American College of Surgeons spring meeting.